I am so happy you have found your way to our website. I have been involved in dogs for a number of years now, both in work and in pleasure. I started my life with dogs as a kid. We had a bassett hound, schnouzers, a toy poodle, and spaniels. I got my first dog when I purchased an inn and moved to the White Mountains at the age of 29. Shortly after that I started volunteering as a puppy raiser, raising service dogs for NEADS. I raised a number of puppies for NEADS and learned a great deal. Working as a puppy raiser cemented my love for retrievers and during my life I have had goldens, labs, and flat coated retrievers. Over the years I couldn't get enough information on dog training. I would attend seminars and clinics and learn as much as I could from anyone willing to teach me. I eventually started teaching basic obedience classes locally. During the 21 years I owned the inn, I also purchased Yellow Snow Dog Gear. At around the same time I openned the doors of the inn to pets, making us one of the first inns to offer pet friendly accommodations. After I sold the inn I started Telling Tails Training Center, operating with Yellow Snow Dog Gear under the LLC, Robin's White Mt Dogs. I continued to teach classes and also started taking more classes until I eventually became interested in showing in AKC rally and obedience. I never stopped working with service dogs. Today I am very involved with the local organization, A.C.T.S. I serve as Chairman of the Board of Directors and also coordinate the training program. 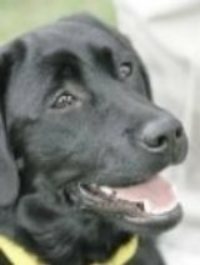 I've worked with countless service dogs and while I love showing and working my own dogs, I tribute much of my dog training knowledge to my work with service dogs. I am always thankful that I found my way into the dog world where I have met and become friends with so many amazing people. Sierra was 13 years old when she passed over rainbow bridge. I think she was my heart dog. I miss her every day. I started my life with Sierra when she was four months old. She was a service dog in training and I was her foster home or puppy raiser. After some time it became obvious that Sierra had some physical issues that would not enable her to do the work of a service dog. She sadly gave up on her assistance dog training, and I happily adopted her as my own. Sierra was diagnosed with cancer in December of 2012. She had regular visits to her traditional vet and to her alternative medicine vet, and I believe she eventually went into remission. She dies 4 1/2 years after her diagnosis. I cared for her diligently during those 4 1/2 years and she was something of a miracle dog. Sierra had a full wardrobe of Yellow Snow dog collars. She liked her yellow dog collar because it shows up so well on her black coat. She also liked any of her dog collars with bones! Kit is our newest addition to the household. 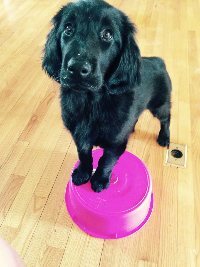 She is a Flat Coated Retriever and she is just a puppy and still learning what is expected of her and where to go potty. I intend to show Kit in both breed and in obedience. Her predecessor, Maggie, did well in obedience so she has big shoes to fill. But she is smart and you can see from the picture I have already started her training with bucket work. (Bucket work is keeping the front feet on the bucket and move around it with the back feet. This helps teach them to use their back end and to swing into heel position for obedience) Flat Coated Retrievers are a wonderful retriever breed with a great work ethic. They are used in hunting but are also very successful in other dog sports like agility, obedience, and rally. Flat Coats have lots of energy and need to work. They are strong willed, hard working, and love to run. They have a playful and silly side as well. Kit's silly side has already come out at 10 weeks of age. She has learned to ring the bells on the door leading to the play yard. What joy there is in her bright eyes when she rings the bells and see's me jump out of my chair to open the door. I don't think she knows why she should ring the bells, but she does know that when she does, she is making me jump! UPDATE: Kit is now two years old. She has been showing in the breed ring with some success and we continue to train for obedience and rally. Kit loves going to classes and she loves training and learning. She enjoys Nosework, Tricks, Obedience, and Rally Classes. Her favorite all time thing to do is chase a tennis ball, or any ball for that matter. She loves to swim and run and enjoys all the puppies in training that are in and out of my household. She doesn't wear collars very often because she needs to keep a nice smooth coat for the show ring, but when she does, she likes to dress up in pink! She is a real girl and likes to flaunt it. 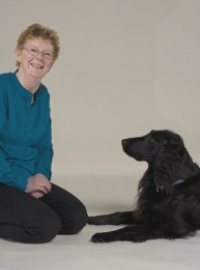 Maggie was my beloved Flat Coated Retriever. She passed away in 2014. 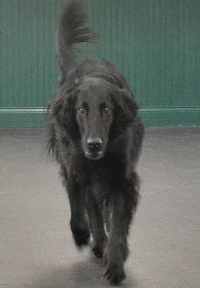 I picked Maggie because I so loved my other Flat Coated Retriever, Abby. When Abby passed away, it took some time, but eventually I set out to find Maggie. She was quite a lady and kept an eye on all that was around her. She loved to run and play and couldn't get enough of her walks in the woods. Maggie also loved to compete in AKC Obedience. She had her Rally Excellent title and had competed at the different Rally levels for a number of first, second, and third place ribbons. Maggie also had her CD and CDX in obedience, and received it with a 1st, 2nd, and 3rd place ribbon.. Maggie was the true queen of our household, a diva dog who loved new collars regularly and we were so proud of her accomplishments. Her favorite pink dog collar hangs on the bedroom doorknob. She loved pink and girly dog collars with flowers. Assistance Canine Training Services is an amazing organization that trains service dogs for people with physical disabilities. The organization founder started it in 2007, in memory of her 23 year old son who died suddenly in a bicycle accident. To date, A.C.T.S. has placed 23 dogs with individuals as service dogs, balance dogs, home helper dogs, hearing dogs, and facility therapy dogs. 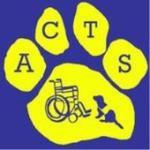 Yellow Snow Dog Gear and Telling Tails Training Center proudly support A.C.T.S. with both monetary and in kind donations. For more information go to A.C.T.S.